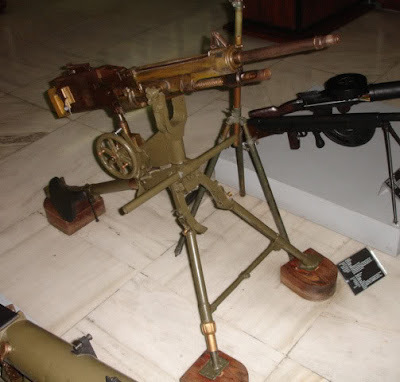 The French St. Étienne Mle 1907 (French: Mitrailleuse Mle 1907 T) was a gas operated air-cooled machine gun in 8mm Lebel which was widely used in the early years of the First World War.It was not derived from the Hotchkiss machine-gun, as often repeated erroneously. It was instead a gas operated blow-forward design borrowed from the semi-automatic Bang rifle of 1903. The Bang system was transposed in 1905 to the French "Puteaux" APX machine-gun which soon proved to be unsatisfactory. 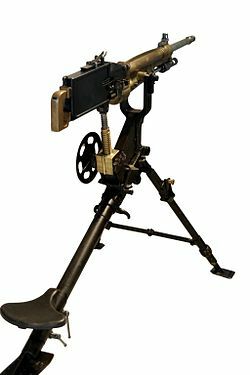 Then, two years later, the Mle 1907 "St-Etienne" machine gun followed as an improved redesign of the "Puteaux" machine gun. However the Mle 1907 "Saint Etienne" was only a partial redesign : the original blow-forward gas piston, rack-and-pinion system and bolt mechanism of the Mle 1905 " Puteaux" machine gun had all been kept unmodified inside the newer weapon . 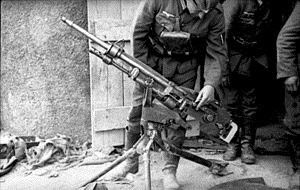 Eventually a total of over 39,000 "St-Etienne" Mle 1907 machine guns were manufactured between 1908 and late 1917. They were widely used by French infantry during the early part of WW-1 until their replacement by the simpler and more reliable Hotchkiss M1914 machine-gun. Around the turn of the century the French military evaluated machine guns made by the private French firm of Hotchkiss et Cie. 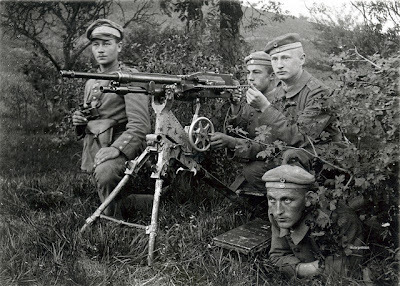 While the tests were technically convincing, following which Hotchkiss machine-guns were purchased for French alpine and colonial troops, it was decided for political reasons that a machine gun for French line infantry had to originate from state-owned arms manufactures. A first attempt by a French government arsenal near Paris( APX )was the Puteaux M1905 machine gun inspired by the first gas actuated blow forward Bang rifle system of 1903. It was a deliberate attempt to develop an infantry machine gun that would be mechanically different, as much as feasible, from the patented Hotchkiss Mle 1900 machine gun design. 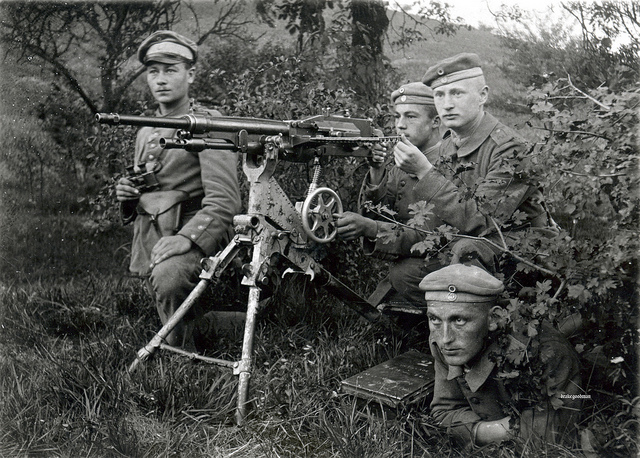 However the M1905 Puteaux machine gun soon proved to be unsatisfactory. 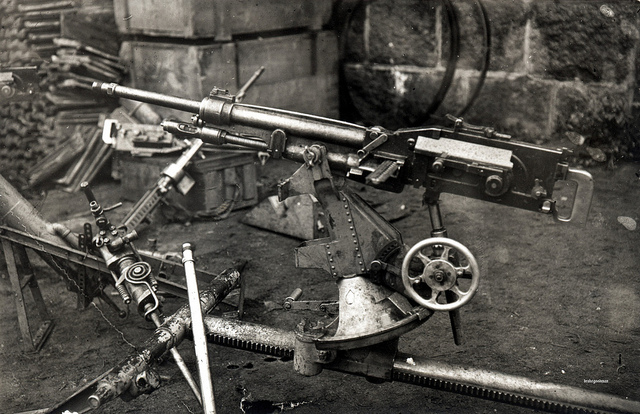 Consequently, the national arsenal at Saint Étienne (MAS) thoroughly reworked and modified the Puteaux machine gun resulting in some measure of improvement but also increased complexity (64 component parts for the St Etienne Mle 1907 vs only 32 parts for the Hotchkiss Mle 1914). Barrel changes on the Mle 1907 St Etienne were much easier than on the M1905 Puteaux and its firing rate could be set at any point between 8 rounds per minute and 650 rounds per minute. Either metal strips or fabric belts, the latter introduced in 1916, for the 8mm Lebel ammunition could be used. However, in the muddy environment of trench warfare the mechanically complex St Étienne Mle 1907 suffered from frequent stoppages and was difficult to maintain by frontline soldiers. A quote from a French post-war military evaluation says it all : " admirable weapon, patented clockwork but temperamental and sparing its whims only to the most meticulous machine-gun virtuosos " ( Revue d"Infanterie No487, p. 486, April 1933). 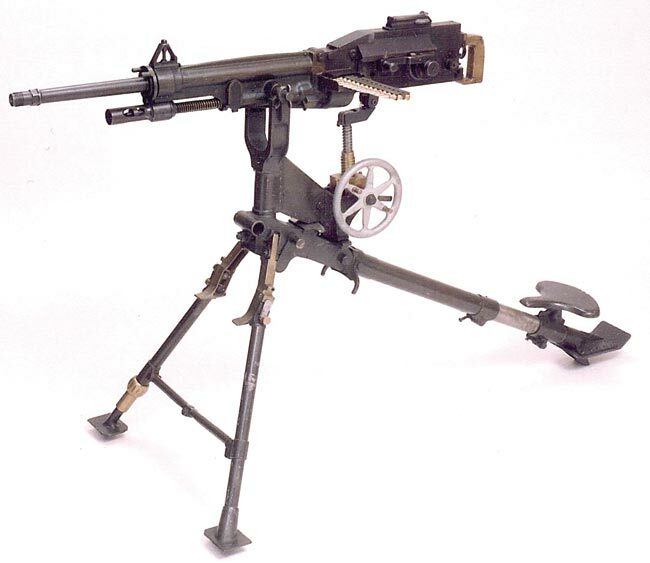 The Mle 1907 St Etienne had to be taken away from the front lines, beginning in July 1917, and progressively replaced by the simpler and much more reliable Hotchkiss M1914 machine gun. 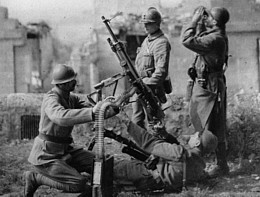 Large numbers of the M1907 St Etienne machine gun were then transferred to military units in the rear, to the French colonies and also to the Italian Army. Many also ended up in the Greek Army during the 1920s. 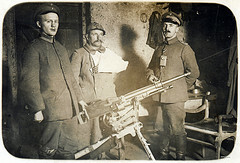 Altogether 39,700 Mle 1907 St Etienne machine guns had been manufactured when the decision to close down their last assembly line was taken in November 1917.